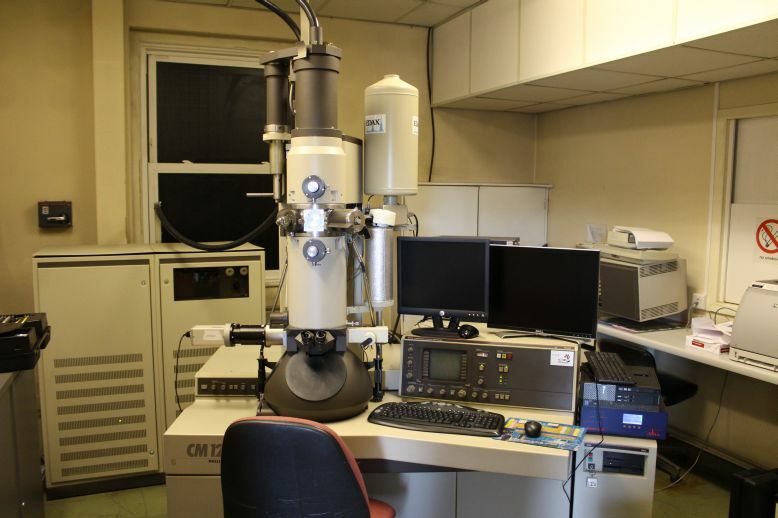 The TEM remains the principal instrument to provide high resolution ultrastructural information from the internal regions of cells (animal or plant) and bacteria, particularly where samples must be scanned for the smallest detail. By use of various fixation protocols, combined with immunocytochemistry, histocytochemistry, autoradiography and genetic hybridisation techniques, cell structures and functions can be localised within either in vitro cell layers and cell/biomaterial constructs or biopsy tissues. The elemental composition of cellular inclusions and small particles are possible using TEM and X-Ray analysis. This can provide data on elemental localisation atmicro and nanoscale not possiblewith many other techniques. The Philips CM 12 TEM has a microprocessor-based control system, and can operate at various accelerating voltages (20, 40, 60, 80, 100 and 120 kV), depending on the sample and technique used. The resulting image can be displayed, captured and saved via a digital camera onto a pc. The microscope has a cool beam gun which causes less damage to the specimen. The sample/grid holder is mounted in a side-entry motorised goniometer stage, which can tilt from -60? to +60? and can be used to provide a stereo-pair image of the sample. The resolution which can be attained is specimen dependant, varying from 1.4Å (for lattices) to 4Å for point to point measurements.Standard magnifications of 1,000 times to 250,000 times are obtained in 14 steps and there is also a low magnification mode providing 100 times to 800 times. Electron diffraction (third image below) is possible with the field-limiting aperture for whole field or selected areas (minimum field of view 0.2?m). An iXRF system provides elemental analysis spectra and quantitation of suitable samples.